Stromboli and Pan Pizzas – One Half Indian. It is the weekend before our one year anniversary, and we couldn’t help but begin celebrating early! We are going to Asheville next weekend and have a slew of restaurants we will go to, so we wanted to do some fine dining at home this weekend and on the actual day of our anniversary. I am doing an Italian style dinner for our actual anniversary, and had some prepping to do today so that we will eat at a decent hour on the big day. Since I was already making doughs and living in the kitchen, I decided to make some pizza for dinner also. Plus, my husband is suddenly obsessed with American football and wants “football” food on Sundays now. Pizza fit the football bill. My pizza dough recipe makes enough dough for two pizzas. If I actually make two pizzas, we end up eating too much. I have tried to half the dough recipe but it does not turn out the same. So, today I came up the idea to use half the dough to make pizza for dinner and half of the dough to make strombolis that we can take for lunch during the week. This is one of the best ideas I have ever had. I may just patent it. The strombolis turned out lovely, and the pizza was honestly one of the best things I have ever made from scratch. 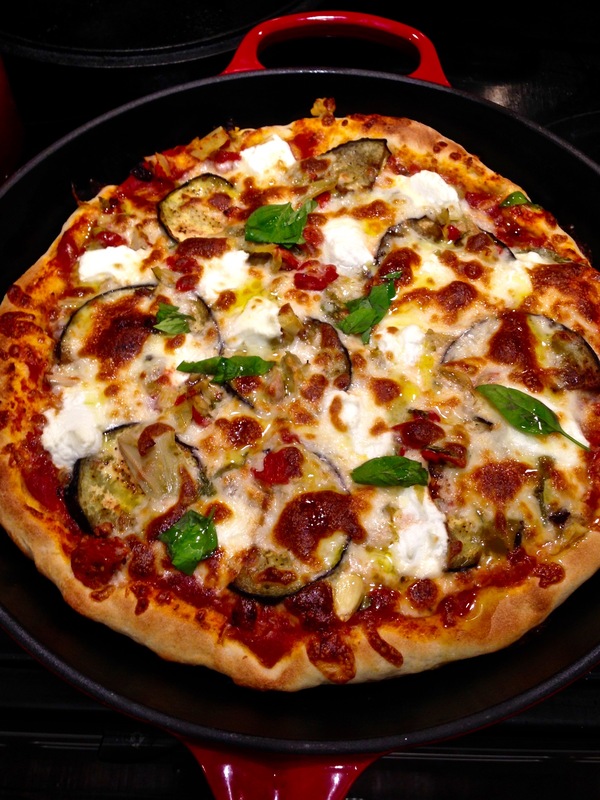 For this pizza dough, I used bread flour. The bread flour did make the dough crisper. I also took a tip from the America’s Test Kitchen Cooking For Two cookbook and started the pizza in a pan on the stove before finishing in the oven. 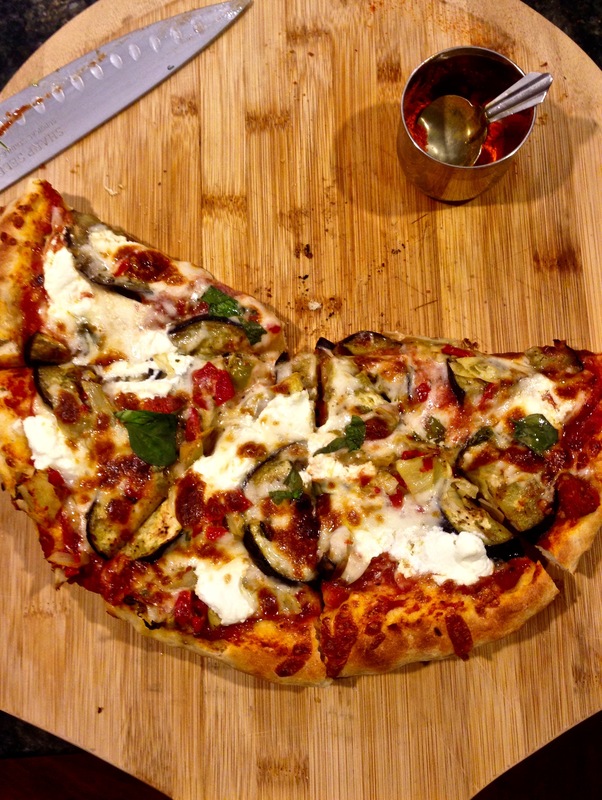 This was easy a super easy method and made for a super crispy and delicious crust. For the strombolis, I took half of the dough and divided it in two. I put my exact same pizza toppings in to the stromboli and sealed it up. These took slightly longer to bake, but were so simple and easy since the stuffings were already out and prepared to be used in the pizza. In short, we are eating like kings this week. Big bellied, happy kings. And queens. PS- Hindi is going well finally! I know my syllabary by heart, am beginning to pronounce more letters correctly, and writing more sentences. Pizza sauce (I used canned tomato sauce mixed with minced garlic, salt, pepper, garlic salt, sugar, dried basil, dried oregano, and olive oil). Olive Bar mix – We had some leftover olive bar ingredients that we chopped very finely. We had some artichokes, onion, garlic, and olives. In the bottom of a 12 inch oven safe pan, place some olive oil and rub it around. 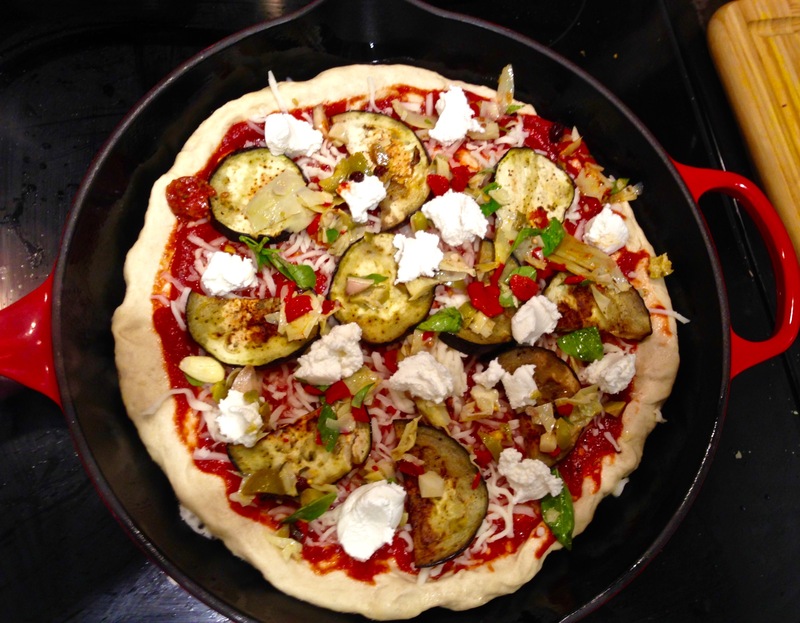 Using 1/2 of the pizza dough, put pizza dough in pan and stretch to edges by using fingers. Allow the edges to become thicker to form the crust. Try to keep the bottom an even thickness. Spread sauce around. Add some mozzarella cheese. Place some eggplants around. Sprinkle with olive bar mix. Drop spinach around. Add more mozzarella. Drop 1/2 tsp scoops of ricotta around the pie. Place this pan on the stove top on high heat. Cook on high heat for about 3-4 minutes. You want to cook this until the bottom of the pizza begins to get nice big brown circles forming. Once the bottom of the pizza has browned, transfer the pizza pan to the stove. Cook for 6 minutes. Broil for the last two minutes watching the pizza closely to be sure it does not burn. Remove from oven, let cool, slice, and devour. Take your other half of dough you did not use in the pizza. 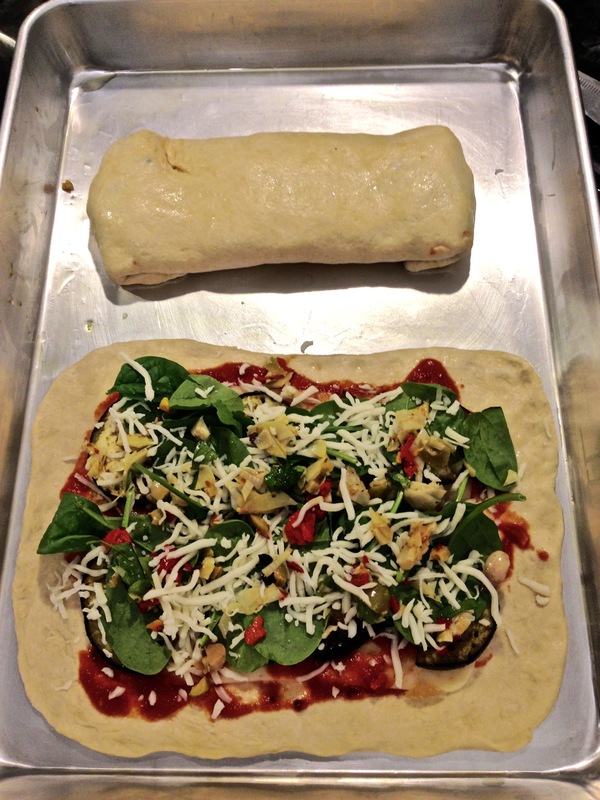 You could make one large stromboli out of this dough or divide it in half to make two smaller strombolis. We divided it so that we could each take one for lunch during the week. On an oiled baking sheet, use your fingertips to spread the dough out into a rectangle. Be careful not to go too thin and create holes. If you make a hole, just pinch the dough together to seal it. I added some sliced swiss cheese to this, and I put that down first. Then I added a thin layer of sauce. Layer the egg plant. Add some spinach. Sprinkle with olive bar mix. 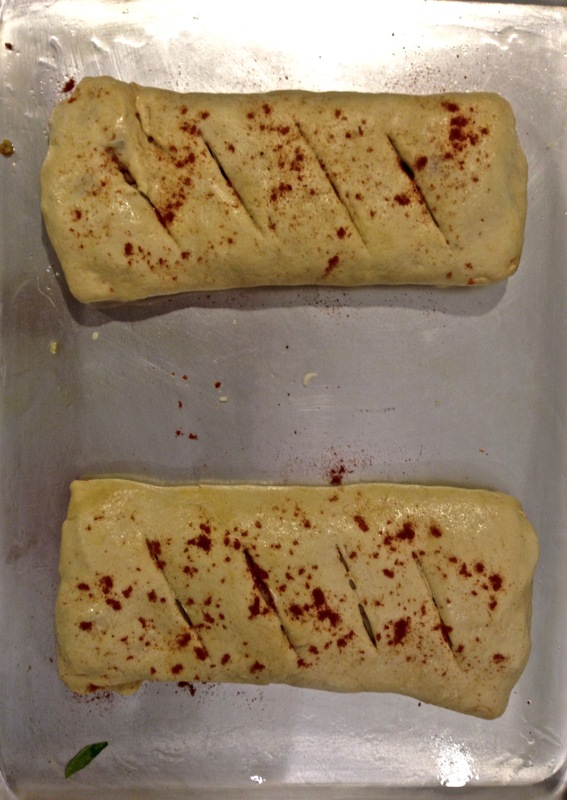 Close the stromboli by folding the dough long ways into thirds. Press the dough together to create a seal. Then fold the ends of the dough up around the open end and seal shut. Press all seams firmly to seal. Flip the stromboli over so that the seals are on the bottom. Put three or four slits in the top to let out the steam. Sprinkle the top with paprika. Bake at 375 F for 20 minutes. Broil for the last 4 minutes. Watch closely while broiling to be sure it does not burn. 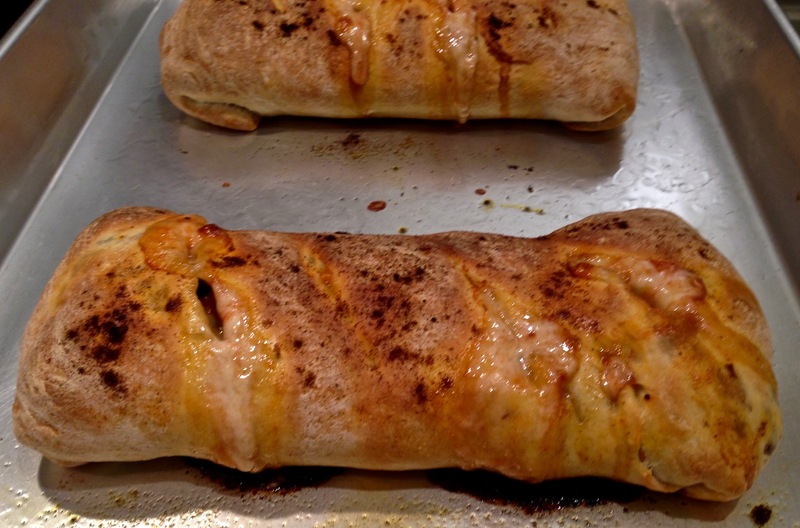 Remove stromboli from oven and allow to cool. Slice and enjoy or wrap it up and take it for lunch the next day!